...it is according to Fly(May)be. A group set up to fight for the future of Plymouth City Airport is working on plans to set up its own airline and is considering seeking a judicial review of a council decision to allow it to close. "Viable" believes the airport can make money and is hoping to re-establish air links between Plymouth and key destinations like London, Glasgow and Manchester by summer 2012. Looks like a niche operation for business only to me even if it does succeed. Whilst new air routes will no doubt open, I would expect that overall air travell will decline. It needs a great deal of increasingly expensive oil derived fuel. Electric trains need no oil fuel, and diesel ones use much less per passenger mile than aircraft. There is growing evidence that crude oil production has already reached a peak, and is declining. Peak oil=peak air transport. Even those who do not accept that oil production has peaked, tend to accept that it soon will. Flybe evidently believe that one (or more?) of their competitors is headed for 'Carey Street'. 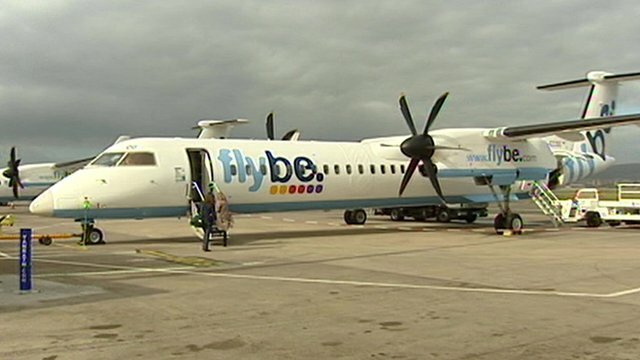 FlyBe boss Saad Hammad: "We have excessive costs which we must deal with immediately"
Flybe, the Exeter-based airline, has announced plans to cut 500 jobs across the business, despite reporting a return to profit. Pre-tax profits were ^13.8m for the six months to 30 September, compared with a loss of ^1.6m a year earlier. The company said its turnaround plan was on track to make ^40m of savings this year and ^45m in 2014-15. But the pilot's union, Balpa, said it was "shocked" by the decision to cut jobs. Flybe employs 2,700 staff. Flybe has been carrying out cost-cutting measures, but chief executive Saad Hammad, who joined the company in August, said more were now needed. "It was clear to me that the existing Phase 1 and 2 cost savings were necessary but we simply needed to do more and to do it immediately," he said in a statement. Mr Hammad told the BBC he could not say where the latest job losses would fall at this stage. "We're consulting with unions and our staff," he said. Flybe cut 490 jobs in 2012-13, with a further 100 going in the first half of 2013-14. As part of the cost-cutting programme some routes could "possibly" go, Mr Hammad said. "These are challenging times," he added. Group revenues rose to ^351.1m in the six months, up from ^340.8m in the same period last year. The carrier now has 96 aircraft in its fleet, with 28 belonging to Flybe Finland, its joint venture with Finnish Air. Passenger numbers increased 5.6% to 4.3 million in the first half of the year. Investors welcomed Flybe's decision to carry out additional cost cuts, sending its shares up by 40.5% to 95.75p. No airline is finding it easy at the moment. They rarely do. Even the all-conquering Ryanair has announced two profit warnings in two months and pledged to be nicer to its customers. But Flybe is different to all those big companies. It runs smaller aircraft and doesn't fill them up as much, making it harder to turn a profit. Plus, 74.3% of its flights are domestic, meaning that it often pays two lots of Air Passenger Duty, because you pay every time you take off from a UK airport. A flight abroad only pays once. John Strickland, director of JLS consulting, told me that Flybe's future relies on making their own regional model work, competing with the trains for example, rather than going head-to-head with the big low-cost airlines. And step one is to start selling more seats on each aeroplane. Regretably, Flybe are in big trouble. The likes of Ryanair and Easyjet can make low-cost operations work because they have massive bases - Easyjet now have over 60 aircraft based at Gatwick and Ryanair over 40 at Stansted (round numbers). With that kind of critical mass, you can make the most of aircraft and pilot resources. Flybe's problem is that their biggest bases, Southampton, Birmingham and Manchester, are a fraction of this size (eg, 8/9 aircraft at Southampton) and many others a lot smaller with only a handful of aircraft. With only a few aircraft, flying a few routes at fixed times per day, it's very difficult to get the most utilisation out of the aircraft and their pilots, which means unit costs are high, especially at the smaller bases - Jersey, Guernsey, the Isle of Man, Inverness and Exeter, which is the airline's Head Office are examples of this. Trying to run those types of services with "low-cost" fares just does not work. Rumours suggest that they will aim to survive by re-trenching to the main bases and sweating the assets at those locations. I could go into much more detail, but this is a rail forum! If John Strickland's track record with the air industry is as good as his track record with boy bands, then Flybe should be safe. I do think Flybe will survive, but many of the more marginal regional destinations they serve, some on a very seasonal basis (Newquay being a great example*) may not. As part of this, bases like Southampton may actually gain routes - an application has already been made to serve Frankfurt from there from next year, for example. There is also talk that they may press their Southampton fleet into nightime service on routes to Spain, Portugal and North Africa - this is what I meant by sweating the assets, which currently sit idle at Southampton between roughly 10pm and 6.30am (when the Airport is closed). 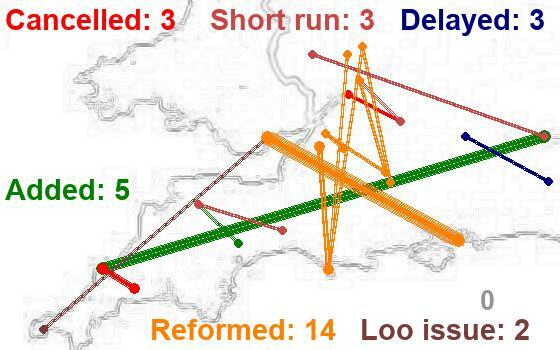 There is also talk that they are looking for another "London" Airport from which to operate the routes they will give up at Gatwick next March. An application to serve Guernsey from Luton has started tongues wagging that they may also consider Newquay from there (they already serve the Isle of Man and Jersey from Luton in Summer). * for info, in addition to the Gatwick-Newquay "lifeline" service that Flybe will already give up at the end of March '14 (having raised ^20m in cash by selling their Gatwick slots to Easyjet), they currently also operate to Newquay from Manchester (year round, with reduced frequency in Winter), Edinburgh, Newcastle, Norwich and Belfast City - the latter 4 all being July-Sept (Summer hols) services, once a week. There is no "may not" about Newquay though. It has already been announced Flybe are ending all flights from Newquay in March 2014. Unfortunately I don't think Newquay airport has a future, at least as a domestic airport. How long will Cornwall Council continue to plug the 3 million a year loss the airport is generating, whilst making such large cuts elsewhere. There are a lot of people commenting on local media websites, how they are cutting bus service subsidies, but continue to subsidise Newquay airport so heavily, yet the bus services cuts are having a much more significant impact on Cornish people. Cornwall council are also going to offer a subsidy to any airline that steps in to take over from Flybe on the London route, on top of the ^3 million a year losses they are plugging already at the airport. Incorrect sir, please read the note at the end of my previous post above. If you go to the Flybe website and look at the online timetable, you will see that NQY-LGW flights do indeed end at the end of March next year (the end of the winter season in aviation parlance). But, as of now, the others that I mentioned from MAN, EDI, NWI, BHD and NCL (sorry, quicker to use IATA codes!) are still scheduled to operate (and if they are in the timetable, that means they are on sale too)......whether those plans will change is another matter. BB, I've used Flybe at Southampton quite a bit over the years, mostly for domestic and close European business trips, and would recommend it - if the route you need to fly is available from there. Because of it's size and the closeness of Car Parks, I have been able to be in the car and on the way home (to Thatcham!) 10 minutes after stepping off the aircraft - try achieving that at Heathrow or Gatwick! As you may have seen, it's good by train aswell, the Parkway Station is right across the access road from the Terminal. The only other thing to say is that Southampton is *very* reliant on Flybe (who fly probably 90% of it's passengers), so it will live or die depending on the airline's fortunes and what it decides to do with it's ops there. I live close to the flight path for Southampton, not sure i've ever *not* seen a Flybe plane!